Among us, Thomas Kelly, the photographer of Himalayan Style, Thomas Schrom the book designer and I have 100 years of experience living, working and traveling in the Himalayan region. But when the first earthquake struck Nepal on April 25th, 2015, we were as unprepared as everyone else. Thomas Schrom was heading up a hill on his motorbike to the annual picnic of an organization he worked for, the Kathmandu Valley Preservation Trust. His motorbike suddenly flipped over. Sprawled on the pavement, he looked up at the sky and a waving power cable as brick buildings collapsed on both sides of the road. 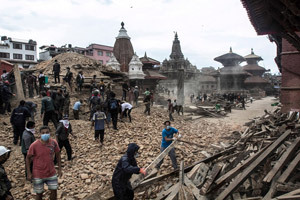 When he righted himself, he looked down to the Kathmandu valley where clouds of dust as buildings collapsed in the historic town of Bhaktapur. As everyone did in those first moments and hours after the quake, he moved quickly to see what had happened around him. (I was in Tibet, as yet unaware of the calamity.) The staff-members of KVPT were safe at their picnic site. He drove to Bhaktapur. 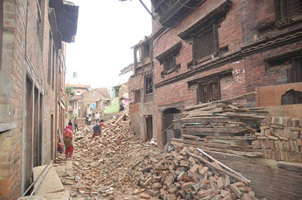 Uncountable houses had collapsed, people were dead inside. He found the Austrian architect, Götz Hagmüller, and his wife Ludmilla, still safe in their home, an 18th century priest’s house. He drove on to Patan Darbar, a World Heritage Site that he had been working to preserve since 1991. One of three palaces had partially collapsed, and so had several temples. He returned to his home, relieved to find it still standing in its corner position in a courtyard of houses built side by side. 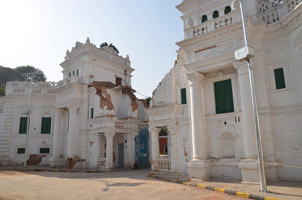 Meanwhile, when he learned his family were all safe, Thomas Kelly and his son Liam got on their motorbikes and surveyed the city with their cameras—the famous Bhimsen tower that had collapsed with people inside, the temples of the Kathmandu Darbar, and beautiful Rana-era palaces and grand houses. In those first hours it was still unfathomable how much our lives had changed. But the earthquake in April, and a subsequent quake in May, changed the fabric of life in Nepal forever. Our hearts were heavy for lives lost and lives still in danger from landslides and other after-effects. And we had another kind of sadness: a grieving for beauty gone. The writing of my book, Himalayan Style, took seven years. I could not have presaged the earthquakes in the spring of 2015 that damaged or destroyed each of the buildings in Nepal that we depicted in our book. After the earthquake, Thomas Kelly revisited and photographed the lost or damaged sites we'd earlier documented. We realized that our book had become an important record for Nepal, as well as a source of inspiration for rebuilding. 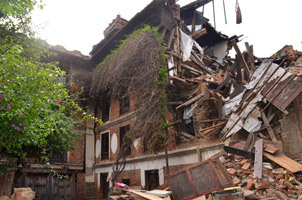 Many of the traditional houses in the Kathmandu Valley and in 14 outlying districts were damaged or destroyed. 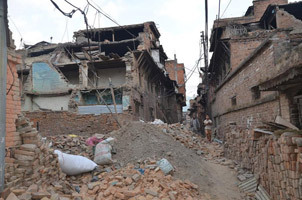 Kathmandu's neighboring town of Bhaktapur suffered huge loss of life and destruction of traditional homes. Of homes pictured in the book, the home of Austrian architect Götz Hagmüller is damaged but repairable, whereas the home of the German ethno-musicologist Gert-Matthias Wegner is gone forever. Scenes from Bhaktapur on the streets beside Kuthu Math (left, photo: Thomas L. Kelly), a preserved Newar priest's house and the residence of architect Götz Hagmüller. Future generations–Nepalis and people of other nationalities from all over the world–will never know what beauty existed in village after village across a central swathe of Nepal. One of my favorite villages in Kavre district that we depicted in the book, Saathigar, is now reduced to rubble. We can only hope that in the years to come its unique "Himalayan Style" can be reborn. With over 660 photos, Himalayan Style brings to light the strength and diversity in design not only in Nepal, but all across the Himalaya. 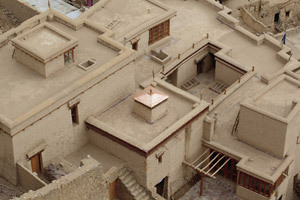 Our book's 304 pages cover a wide range of buildings and objects created in Nepal, India, Tibet and Bhutan. We wanted to pay tribute to the architects and craftsmen who are adding to the treasury of Himalayan buildings and hand-crafted objects. 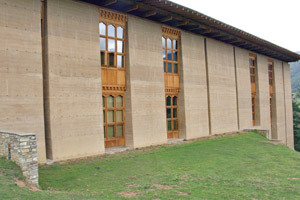 Therefore the book documented buildings that in recent years were renovated for new use, such as the Malla-era brick palace became the Patan Museum, Nepal's most unique museum; the Trongsa dzong watchtower in Bhutan that was also turned into a museum, and the minister's house in Leh that was converted into an arts and media center. We looked at new locally inspired architecture, including the Amankora resorts in Bhutan and the Druk White Lotus school in Shey, Ladakh. 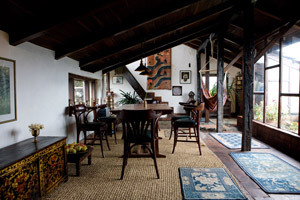 We spotlighted architects and craftsmen we admire, such as Götz Hagmüller who has spent much of his lifetime creating and recreating Himalayan spaces. Indeed our task to create the book began with a sense of urgency, as the loss of Himalayan style homes and other buildings had begun well before the earthquakes. In the Kathmandu Valley, modern cement homes and apartment buildings and shopping malls were quickly replacing traditional dwellings. 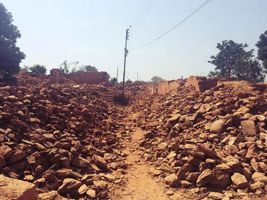 The government of Nepal's road-widening program caused indiscriminate destruction of homes and even ancient temples. Elsewhere in the region huge damage was caused by fire: Wangdi Dzong in Bhutan was destroyed by fire, as was a third of the ancient Tibetan tea-trading town of Gyalthang in Yunnan. After the earthquakes, How to 'build back better' is a hotly debated issue in Nepal, and it is hoped that in the building back there will be careful attention paid to recapturing the beauty of the homes and villages that have been lost. Currently, relief efforts focus on quick and easy solutions to help people through the monsoon: tin sheds, earth-bag buildings, bamboo structures. 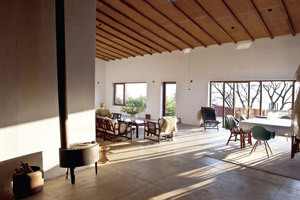 The renowned architect Shigeru Ban has designed new structures for Nepal that use recycled materials. 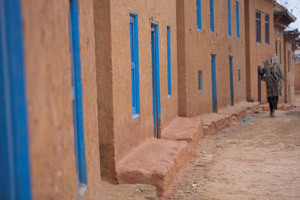 Slowly plans are developing how to make better permanent buildings with local materials and design. It is hoped the buildings will have the integrity and character of the modern homes, schools, museums and hotels that we depict in 'Himalayan Style'. When temples and monuments that are World Heritage Sites are built again, they should be reinforced against future earthquakes. The anticipated shortage of qualified labor and building materials, especially of custom-made brick and hardwood timber, could cause obstacles for future reconstruction work. There is also immediate need to support environmentally friendly methods of brick production and to increase output. Furthermore, the loss of life caused by collapsing historic buildings makes it mandatory to rethink existing conservation laws. Government restrictions on modern materials such as cement in conservation work need to be reviewed and newly defined to limit future risk. 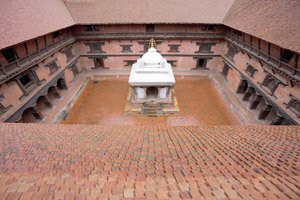 Left: A toppled temple pinnacle on the Patan Darbar, a World Heritage Site. 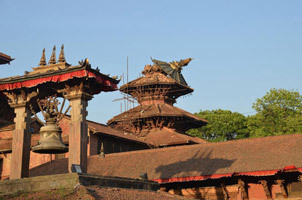 The good news is that bringing the country's heritage back to its former glory will result in a range of opportunities and benefits, in particular for Nepal's world class craftsmen, artists, architects, conservators, historians and engineers. In this way we believe that there can be a resurgence of 'Himalayan style.' And in the era of rebuilding, we feel our book, Himalayan Style, has a vital role to play. 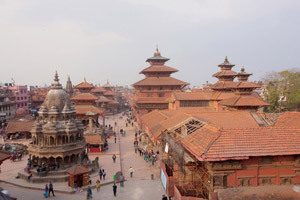 The Patan Darbar Square (left), and after the earthquake with collapsed and damaged temples. 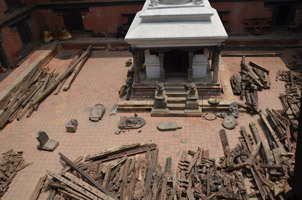 Timber struts and columns and stone sculptures from destroyed temples are safeguarded within the Patan Museum courtyard. Behind the Patan Museum, a view of the Bhandarkal hiti (or tank) and collapsed walls and rooftops. A preserved Newar priest's house and the residence of architect Götz Hagmüller. The house suffered damage, but surrounding homes were completely destroyed. 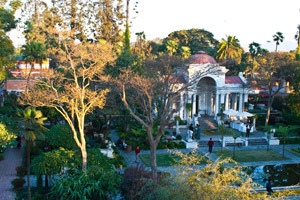 Kathmandu's Garden of Dreams (left) whose pavilions were severely damaged in the quake. 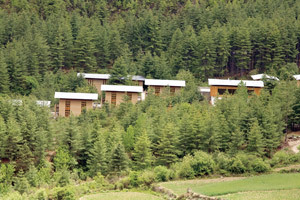 Top row, Amankora lodges, Bhutan. 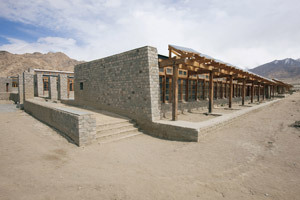 Middle row: left, the Druk White Lotus School in Sheh, Ladakh and right, the Ladakh Arts and Media Organization (LAMO) in Leh, Ladakh. 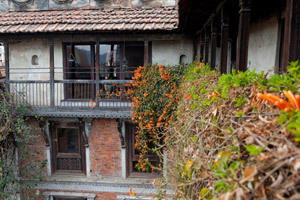 Bottom row: left, the home of a couple who design cashmere in Kathmandu, and right, the "glass house" home of Leslie Shackleford in Kathmandu.